The ascending triangle is similar to the symmetrical triangle, except that only one side is sloping. An ascending triangle pattern is characterised by a usually flat level of resistance at the top with the lower side sloping upwards as the price reaches higher lows. It can signal weakening resistance and an approaching breakout to the upside. These higher lows indicate that the bulls are gaining strength which presents you with a possible buying opportunity. This lesson will show you two ways to trade using ascending triangles. One way to trade using an ascending triangle is to enter once the resistance level has been broken and the price starts to move to the upside. You can place the stop loss below the upwards sloping side of the triangle pattern and measure the profit target by taking the height of the back of the ascending triangle and extending that distance up from the trend line breakout. Entry as the price breaks out of the triangle to the upside. Stop loss goes just below the slope of the triangle. Profit target goes the same distance away as the back of the triangle. The second option is to wait for the price to break out of the triangle (breaking through the resistance level), as in the first example and then look to place a buy order on the retest of the previous support line (broken resistance now becomes support). The stop loss would go below the new support area and the profit target would remain the same as in the first example – the length of the back of the triangle. 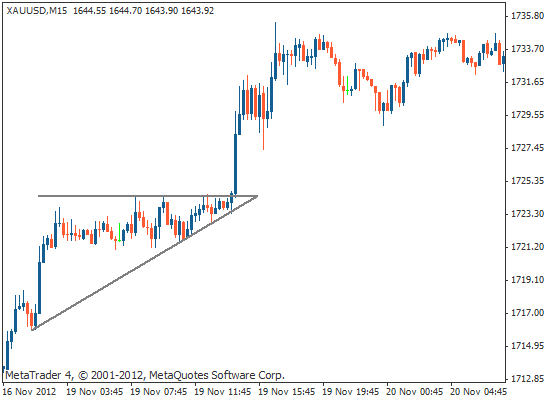 an ascending triangle pattern is a signal of weakening resistance and a potential upwards move. This presents you with a possible buying opportunity. you can enter after the resistance level has been broken, either on a breakout or on a retest of the upper line. you can place the stop loss just below the lower, sloping level. the take profit level is determined by measuring the distance of the back of the triangle and extending that distance upwards from the entry point.